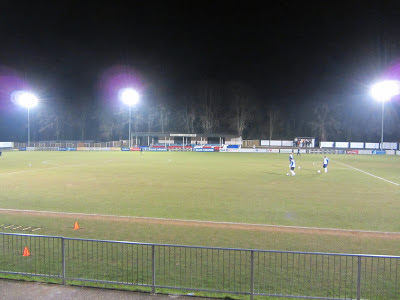 My third stadium of 2013 was on Tuesday 5th March 2013 at York Road in Maidenhead, Berkshire. 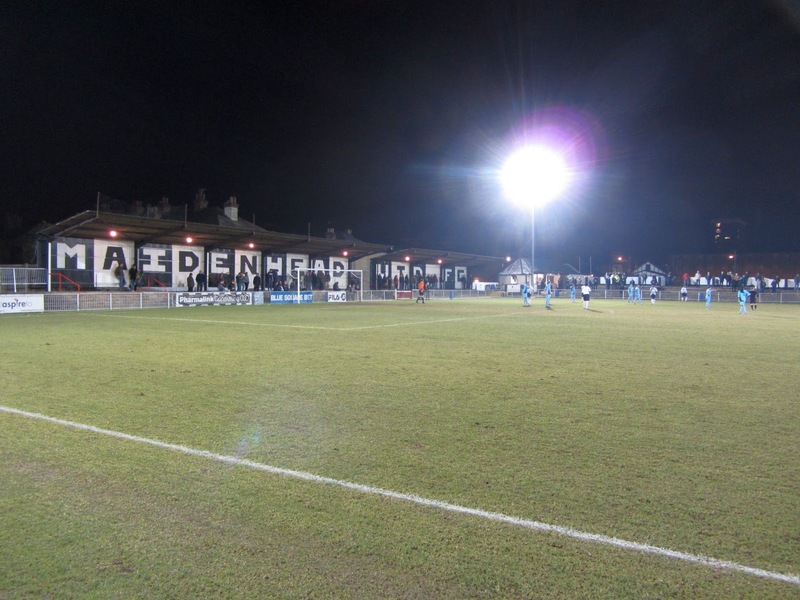 The match was Maidenhead United vs. Dover Athletic in Conference South. York Road is located in Maidenhead town centre, just 400 yards from the railway station. The club played their first game at the venue on 16th February 1871 and the Football Association recognises it as the 'oldest senior football ground continuously used by the same club'. 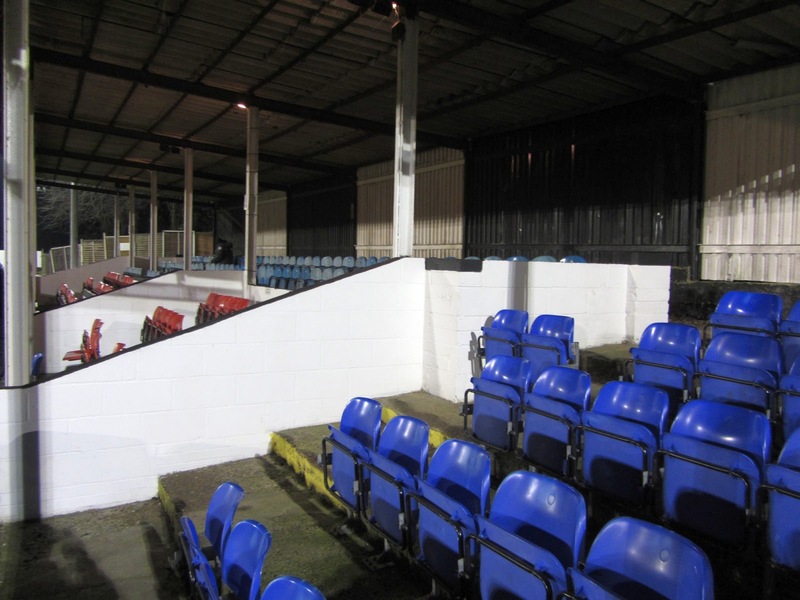 There is one all-seater section known as the Railway Stand which is level with the half-way line on the southern side of the ground. On my visit this stand had 250 seats split across several separate sections with numerous supporting pillars. In 2014 this stand was replaced by a new 550 seat structure with no supporting pillars. Either side of the stand is uncovered concrete terracing which makes up the remainder of this portion of the stadium. The northern end of the ground has has uncovered concrete terracing on one side of the half-way line and a narrow uncovered walkway section on the other. There is also a small covered stand which sits close to the pitch towards the eastern section of the venue. Most of the facilities, including the bar, are located on the northern part of the ground although there are a couple of additional food outlets, one on the eastern end and one in the north-west corner of the ground. The northern side of the ground is also host to the shell of what was intended to be a large new clubhouse. This structure ran into difficulties many years ago and remains how it was left. Most of the western end is taken up by covered terracing with a gap in the middle for a turnstile entrance from Bell Street. Behind the other goal there is a smaller covered terrace section which takes up around one-third of the eastern part of the ground. The rest of this is taken up by uncovered concrete terracing. The game saw Dover start well and take the lead just after the quarter-hour mark. The ball was crossed into the six-yard box and Ben May managed to clip the ball past the keeper to give the visitors a 1-0 advantage. Dover were the better team in the opening 45 minutes and had a couple of decent opportunities to extend their lead but, unable to take any of these, they went in 1-0 up at the interval. Maidenhead started the second period much more energetically than they had the first. There was lots of effort from the hosts but they didn't really test the away keeper and in the 69th minute Dover were able to double their lead. Barry Cogan's shot didn't look like it would cause problems for the home keeper but the ball somehow bobbled past him into the bottom corner of the net. Straight from the kick-off a defensive error nearly led to a third goal for Dover but just when it looked like they were going to run away with the tie the home side got back into it when an unmarked David Pratt nodded home from close range. 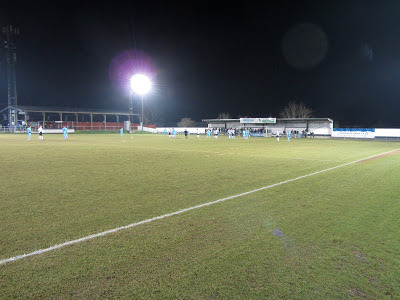 Dover held strong in the face of Maidenhead's attempts to equalise and in injury time even managed to get the ball in the net again only to see their tap-in ruled out for offside. Shortly after this the full-time whistle sounded capping a deserved win for Dover.